Drinking cranberry juice really can cure bladder infections, according to new research and extracts from the fruit could even keep medical devices free of bacteria, say scientists. A study has now found how chemicals in cranberries alter bacterial behaviour, pointing to a potential role for derivatives in implantable devices. Consuming the fruit has been associated with prevention of urinary tract infections (UTIs) for more than a hundred years, although some experts have claimed it is a myth with no basis in fact. Some studies have suggested cranberries work by hindering bacteria from sticking to the walls of the urinary tract, thanks to chemicals known as PACs (proanthocyanidins). Now experiments have found that cranberry powder stopped Proteus mirabilis, a bacterium frequently implicated in complicated bladder infections, from colonising and swimming together. Increasing concentrations of the extract also reduced the bacteria’s production of urease, an enzyme that contributes to the virulence of infections, the Canadian Journal of Microbiology reports online. These results build on previous work by the same team showing cranberries hinder movement of other bacteria involved in bladder infections. Bacterial movement is a key mechanism for the spread of infection, as bugs literally swim to disseminate in the urinary tract and escape the body’s immune response. 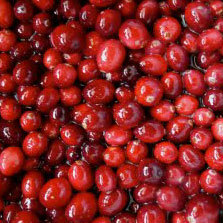 Professor Nathalie Tufenkji, of McGill University, Montreal, said: ‘While the effects of cranberry in living organisms remain subject to further study, our findings highlight the role cranberry consumption might play in the prevention of chronic infections. ‘More than 150 million cases of UTI (urinary tract infection) are reported globally each year, and antibiotic treatment remains the standard approach for managing these infections. She led another recent study published online in Colloids and Surfaces B: Biointerfaces showing the fruit blocked the spread of Proteus mirabilis, suggesting extracts could hinder the spread of germs in UTI causing catheters.